The 15th century Church is located in the centre of the village it has a 109 foot three stage tower. 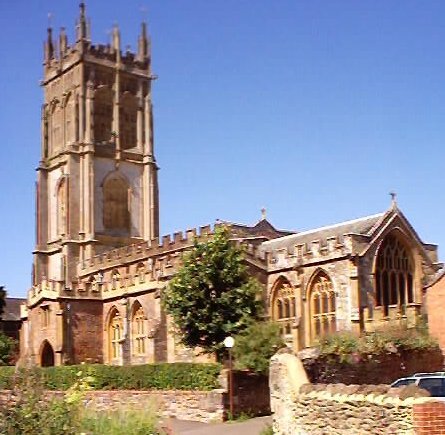 The tower dates from the 1540's and is one of the finest examples of the Perpendicular style in Somerset. The architectural writer Pevsner described it a "tour de force" in a county particulary rich in church towers. It was restored in the late 1980's after an impressive fund raising exercise by local people. The six Church Bells were cast by Thomas Meals of Whitechapel in 1810. The bells were recast by Meals and Stainbank in 1895 in the Whitechapel Bell Foundry. The heaviest bell, the tenor weighs 1.52 tons and has tone of E flat. The smallest, the treble weighs in at a mere 0.378 tons. Its tone is C.
On July 9th 1912 a peal of "Grandsire Doubles" was rung in three hours and eight minutes. This consisted of 5,040 changes. It was rung by E Priddle (tenor), J Hunt (V), P S Merson (IV), F Millard (III), W S Doble(II) and T Doble (treble). J Hunt conducted.